Last week saw the launch of the final report of the Industrial Strategy Commission, of which I’m a member. The full report (running to more than 100 pages) can be found here: Industrial Strategy Commission: Final report and executive summary. For a briefer, personal perspective, I wrote a piece for the Guardian website, concentrating on the aspects relating to science and innovation: The UK has the most regionally unbalanced economy in Europe. Time for change. Our aim in doing this piece of work was to influence government policy, and that’s influenced the pace and timing of our work. The UK’s productivity problems have been in the news, following the Office of Budgetary Responsibility’s recognition that a return to pre-crisis levels of productivity growth is not happening any time soon. Both major political parties are now committed to the principle of industrial strategy; the current government will publish firm proposals in a White Paper, expected within the next few weeks. Naturally, we hope to influence those proposals, and to that end we’ve engaged over the summer with officials in BEIS and the Treasury. Our formal launch event took place last week, hosted by the Resolution Foundation. The Business Secretary, Greg Clark, spoke at the event, an encouraging sign that our attempts to influence the policy process might have had some success. Even more encouragingly, the Minister said that he’d read the whole report. The launch of the final report of the Industrial Strategy Commission, at the Resolution Foundation, London. 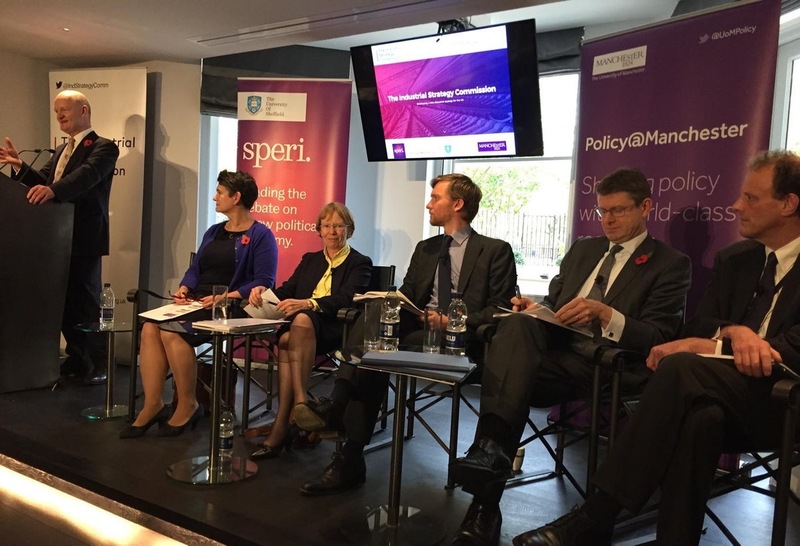 From L to R, Lord David Willetts (Former Science Minister and chair of the Resolution Foundation), Diane Coyle (Member of the Industrial Strategy Commission), Dame Kate Barker (Chair of the Industrial Strategy Commission), Torsten Bell (Director of the Resolution Foundation), Greg Clark (Secretary of State for Business, Energy and Industrial Strategy), Richard Jones (Member of the Industrial Strategy Commission). Photo: Ruth Arnold. Our aim was to help build a consensus across the political divide about industrial strategy – one strong conclusion we reached is that strategy will only be effective if it is applied consistently over the long term, beyond the normal political cycle. So it was good to see generally positive coverage in the press, from different political perspectives. Even the far-left paper the Morning Star was approving, though they wrongly reported that our commission had been set up by government (in fact, we are entirely independent, supported only by the Universities of Sheffield and Manchester). Naturally, they focused on our diagnoses of the current weaknesses of the UK economy, quoting comments on our work from Greg Clark’s Labour Party shadow, Rebecca Long Bailey: Use Autumn Statement to address long-term weaknesses in our economy, says Rebecca Long Bailey. In the more specialist press, Research Fortnight concentrated on our recommendations for government structures, particularly the role of UKRI, the new umbrella organisation for research councils and funding agencies: Treasury should own industrial strategy, academics say. There are a couple of other personal perspectives on the report from members of the commission. My Sheffield colleague Craig Berry focuses on the need for institutional reform in his blogpost Industrial strategy: here come the British, while Manchester’s Andy Westwood focuses on the regional dimensions of education policy (or lack of them, at present) in the Times Higher: Industrial Strategy Commission: it is time to address UK’s major regional inequalities. Finally, Andy Westwood wrote a telling piece on the process itself, which resonated very strongly with all the Commission members: Why we wonk – a case study. Previous Previous post: Should economists have seen the productivity crisis coming?